New version of Models Manager with supporting to new version of 3ds Max 2019, Indigo Renderer and some new features. Also this version uses Revit as default file format for 3d files. 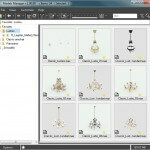 Related to "Models Manager v.1.73.05"